Located in the heart of old Hollywood near Sunset and Vine, 6630 Sunset Boulevard draws upon the Art Deco tradition of Hollywood’s boom in the 1920s and 1930s with a contemporary interpretation. The crystalline six-story tower, encased in glass tiles, includes a new 30,000-square-foot building, ground-level retail, a welcoming courtyard, six live-work lofts and a roof garden. 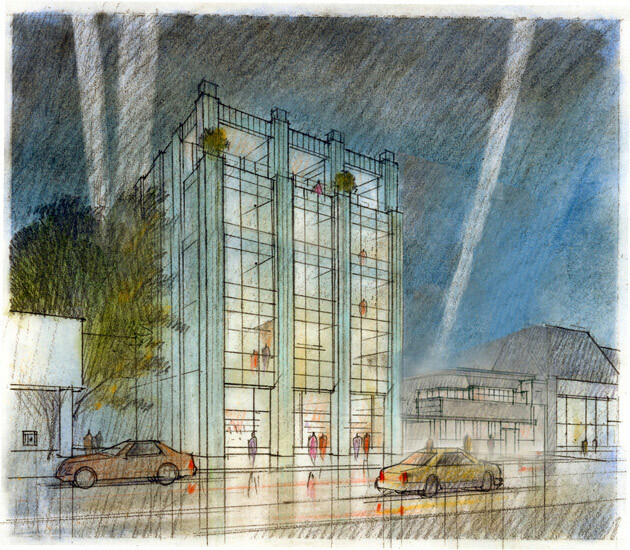 Incorporating a small existing Art Moderne building, it provides convenient below-grade parking for 75 vehicles. A wide variety of sustainable features are integrated into the design to achieve a LEED-Silver level. The building’s delicate ornamental ironwork, generous 24-foot ground floor height, and the strong relationship to the existing street frontage all continue the grand historical context of this Hollywood neighborhood. The design’s innovative, luminescent exterior celebrates the area’s rich traditions by creating a memorable, contemporary image on one of Hollywood’s most storied boulevards.